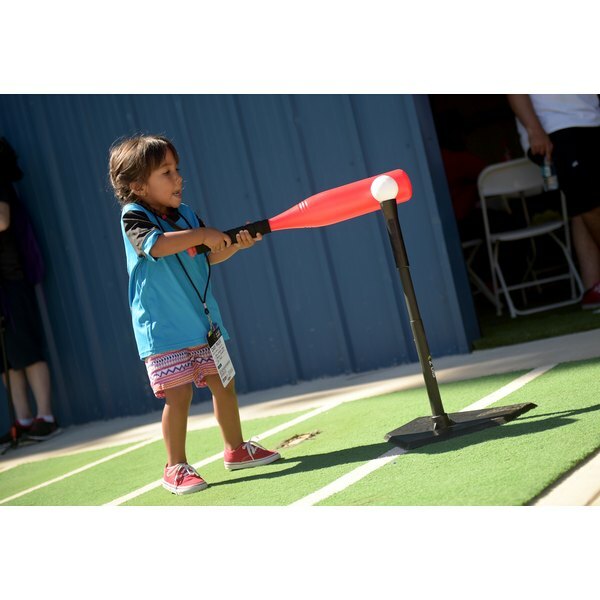 Your child wasn't born with the innate ability to write her name, draw a picture, or swing a bat and hit a ball. Hand-eye coordination develops as part of your little one's repertoire of fine motor skills blossoms. From the beginning basics, such as picking up a small toy, to more major movements that involve a mature complexity of motions, eye-hand coordination builds as your child grows. As a newborn, your baby's hand movements are mainly reflexive in nature. As he grows, he'll begin to use more purposeful movements. By the time your baby reaches the middle of the his first year -- somewhere between 4 and 7 months -- he'll start reaching and grabbing for objects and moving toys from one hand to the other, according to the article "Movement, Coordination, and Your 4- to 7-Month-Old" on the KidsHealth website. Toward the end of the first year -- between 8 and 12 months -- he'll develop the ability to use a pincer grasp to pick up small items, such as dry cereal pieces. While every child develops on a slightly different schedule, if your baby is missing major milestones -- if he doesn't start reaching for and grabbing objects between 4- and 7- months or can't control his hands at all by the end of the first year, for instance -- it's time to call the pediatrician. Although the name "toddler" directly refers to the toddling gait of your newly walking child, kids in this stage are also building smaller skills when it comes to making movements. While not mature yet, your toddler is building fine motor abilities, such as hand-eye coordination. By 2 years old, she should be able to pick up and stack five blocks, hold a writing utensil and eat with utensils on her own, according to the experts at the Baby Center website. Between 2 and 3 years, your tot will continue to grow her hand-eye coordination, drawing with lines and circles and turning pages in a book by herself, notes the American Academy of Pediatrics on its website, HealthyChildren.org. Keep in mind that your toddler refusing to use her spoon is different than your toddler not being able to. Refusing to do something is an independence issue, while lacking the ability may signal a problem that you need to address with the doctor. Your preschooler's budding self-control may not seem mature, but it is building up enough to provide a background for his growing hand-eye coordination. With a developing ability to concentrate, your 3- to 5-year-old can engage in more complex fine motor activities, such as tracing squares and circles, according to HealthyChildren.org. During this time, he's also developing spatial awareness skills that coordinate with his hand-eye abilities to position small objects -- such as toys or blocks -- and better control eating utensils. If you notice your child is finding motor tasks, such as throwing a ball overhand, grasping a crayon between his thumb and fingers or copying a simple shape, a challenge, HealthyChildren.org suggests consulting a pediatrician. By the time your child reaches the grade-school years, her fine motor skills have matured enough to let her master most basic eye-hand coordination tasks. She'll have the ability to print letters, feed herself, dress herself -- using zippers, snaps and buttons -- and manipulate objects easily. As she moves through the elementary years, she'll develop more sophisticated eye-hand coordination, allowing her to play sports such as baseball, basketball or tennis. School-age kids' eye-hand coordination abilities vary greatly. Just because your second grader can't hit a home run or draw a masterpiece doesn't mean she has a problem. That said, if she's struggling with daily fine motor tasks, such as printing her letters, or her teacher has concerns, call the doctor for a professional evaluation.